Obverse: Deer and trees. Reverse: Hands and a sculpting tool with deer. Text "Brookgreen Gardens South Carolina". This is not the work of Marshall Fredericks. 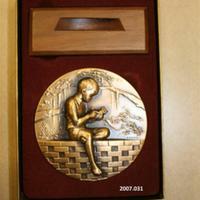 Obverse: A boy with carving tool in his hand carving an owl He sits on a brick wall with trees in the background. Reverse: Girl carving a little boy on a sculpting stand. 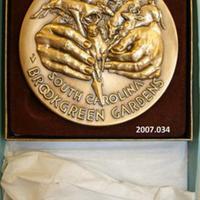 Words "Brookgreen Gardens South Carolina" are on the sides of the medal. This medallion is not the work of Marshall Fredericks. It is signed "Parks" at center right. 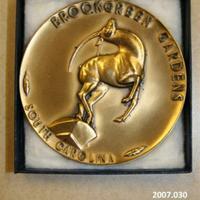 Obverse: Leaping Gazelle with "Brookgreen Gardens South Carolina" text. Reverse: Flowers with birds.